Poor design leads to poor experiences not just for doctors, but even for nurses and physicians. HE asked multiple stakeholders about remedies for this problem. Here’s what they said. Designing and planning to build a hospital requires exceptional knowledge and skill in various fields. Currently, medicine tends to be a holistic discipline, according to which the individual should be treated as a whole and provided with comprehensive health care related to physiology, biochemistry, nutrition, exercise, social relationships and also the habitat. “Today, architecturally speaking, we tend to subscribe to this holistic commitment to health, seeking better visual and spatial quality and greater readability of hospital buildings that may be beneficial for patients. Patients are increasingly demanding comfortable environments that feel more like a home than a medical facility. That also indicates that beauty and comfort are as just as important to a patient’s well-being as a sterile environment. Being in a healthcare facility causes anxiety. To that end, healthcare architecture is increasingly attempting to allow for more personalised patient rooms to reduce anxiety while enhancing satisfaction. Features like patient communication boards and customizable digital signage with the name of the patient, family photos and more are being incorporated into healthcare facilities. No longer an afterthought or simply aesthetics, healthcare design is improving the patient experience – encompassing the delivery of clinical and operational services throughout that journey – and driving real transformational change. Being proactive with feedback allows healthcare staff and facilities to serve patients during their stays better,” says Rohit MA, Co-founder and Managing Director, Cloudnine Group of Hospitals. Now posts about the experiences of patients are spilling even on social media. And rising in this surge is a slow revival of interest in not just the construction or the workflow in a hospital but also in its design – more popularly known as the User Experience. “Simple things like proper ceiling height, increased use of natural light, natural materials and textures, cheerful and varied colours, bright open public spaces, adequate privacy for patients and their relatives, and the homelike environment in consultation rooms are the key to a rich patient as well as caregiver experience,” says Ameya Shete, Head of Business Development, Healthtech Pivot. Even imaging centres give priority to a healthy design these days. Take the example of Chandrika Sahay, a lead architect Meraki Dezine. She kept health benefits in her mind while designing the Mahajan Imaging Centre in Gurugram. It is warm and welcoming, and helps reduce the anxiety of visiting patients, while at the same time adhering to hospital standards. Elements of cognitive design that appeal to all five senses have been incorporated. Vibrant colours, biophilic elements such as custom graphics, a vertical garden, a tall cascading, water feature at the entrance, distressed wood flooring and an MRI room that has artificial grass with a theme based graphic (the only one in the world) are only some of these unique elements of design that help elevate the mood of visitors. The furniture has been custom designed and made by local carpenters. The weaving of nylon straps, a typical Indian technique used in charpai has been used for folding beds for the waiting area chairs. Pendant lights with filament bulbs suspended with the help of ropes were used to light the reception and common areas. The reception area was pulled towards the center for ease of circulation of patients to the various diagnostic rooms. A wall has been dedicated to artworks of special children who were born without sight but have gained vision after treatments. All such design elements and detailing, actually increases the reliable outcome of patients’ scans. When all the senses are in balance, and emotions are regulated, that is the real moment at which healing begins. This factor definitely instills confidence in patients. “The next phase of medicine will need a redefinition of patient-centricity which encapsulates not only the improvement of clinical parameters and health outcomes but also patient experience, acceptability and affordability. Let us, however, not forget how far we’ve come in the last couple of decades,” says Rohan D’Souza, co-founder of Medtive. Interestingly, a central issue forming the patient experience in a hospital is waiting and moving around. For most of the patients travelling from the ninth floor to the billing department or pharmacy on the ground floor, itself can be cumbersome and can lead to contracting infections. Take the case of Kunal Vaidya, who visited a private hospital in the maximum city. “I went to the emergency medicine department. I had to move from one department to another to find my registration number, while I was in a wheelchair. It is critical how the flow of the patient case is designed and managed. Indian hospitals have a lot to learn from other industries,” adds the founder of Think Drum. 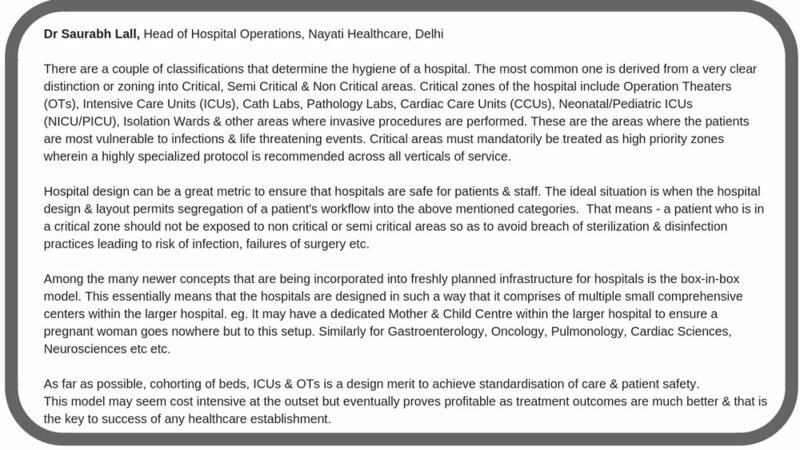 On a serious note, Vaidya points out that most of the hospitals don’t follow evidence-based design. There is no differentiation between an OPD or a casualty medicine department in many hospitals. If there’s space for 50 beds, several managements add 75 beds and forget about other amenities. This is not a healthy practice,” he says. For some time now, hospitals are designed based on specialisation. Within the hospital, there is the flow of patient and supplies as well as the flow of care episodes and service encounters. Dr N Sippy, Associate Professor of DY Patil University, points out that simulation labs are an essential part of the healthy hospital. “Healthcare providers must be properly guided and properly trained to handle patients with the utmost attention to their ultimate care well being. Creating a culture of safety as a global priority means coordinating and collaborating on a patient-centric set of standards across all aspects of a patient's journey. This must encompass the healthcare provider's education, training, and deliberate practice as a professional. The presence of a high fidelity medical simulation lab in the hospital not only improves clinical outcomes of the staff but also can be a pivotal role in enhancing team building & crisis management,” explains the professor. Is Design Thinking the Solution? Alternatively, management must design the facility around what is needed to deliver patient care in a timely and high-quality manner. So, can design improve the well being of a patient? “Yes,” says Dr Arup Mazumdar, Chief Evangelist, Design Thinking, Founding Fuel Publishing Private Ltd.
“The pathway is through Design Thinking, an empathetic and iterative approach to bringing in a better experience for all the stakeholders. This type of creative problem-solving technique handles the opposites of cost vs quality (example: company goals vs the user’s goals, doctors and nursing staff insecurities due to new technology interventions. I have seen great in-hospital experiences being ruined by terrible discharge experiences. I have witnessed the state of the art equipment hospitals with pathetic facilities for both CareGivers/Interns/Doctors. There are a plethora of silos which need to be broken to seek a better-desired future.Can you boil the ocean? No!Can you boil it one kettle at a time? Yes. So choose your stakeholder/user carefully and apply Design Thinking to give him a better experience. Then use a Human Centric approach using a method called Ethnography and a Journey Map to gain insight into their unmet needs(Need finding), Ideate, then quickly Test the Prototype with the user and iterate till you get the desired future(Implementing),” he notes. While not all hospitals are investing in healthy design, it’s definitely a trend, that is catching on. Lavina Utamani, CEO at The Design Way, points out that India has a long way to go, when it comes to design. “If you go inside the maternity wards of government hospitals, one can even see rodents. There are several solutions easily available in the market like hospital door handle which doubles as a hand sanitizer, which can be easily incorporated to the design. Westerners don’t have issues like humidity, dust etc. But Indian hospitals need design solutions like cloth caps for foot wear of doctors and biomedical staff in OT. Last year, I had designed a footwear stand for OT with filter control for a hospital. We need more Indian solutions customized for our problems,”she concludes.